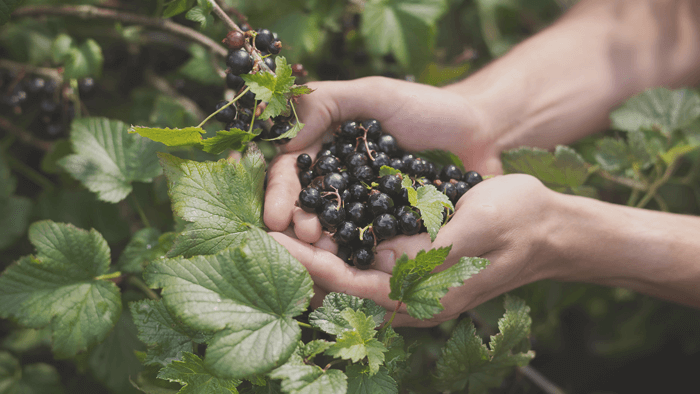 Amonbê | Blackcurrant: The Elixir of Life! 04 Mar Blackcurrant: The Elixir of Life! What do grapes, tomatoes, blueberries, chokeberry, currants, sea buckthorn, blackcurrant, rose hips, juniper and black elderberries have in common? All are fleshy fruits, which contain seeds scattered in the pulp. They are known as berries. So, why are we discussing this? Well, because the buds of all these berries rejuvenate our tissues and act on all fronts to keep us healthy. And even if our earth is a paradise that is being ransacked, Mother Nature remains, for the time being, a vast natural pharmacy. Blackcurrant (Ribes nigrum) may be the most nutritious fruit of all. For a long time, it was called ‘the forbidden fruit’ in the United States. This was largely due to the belief that the tart berries, native to Europe and Asia, helped spread a fungus that killed pine trees. Due to the ban, many in the US have missed out on these nutritious berries. And while most super fruits are high in specific nutrients, blackcurrant is exceptional in the full range of nutritional components. Data from USDA shows that volume-for-volume in terms of minerals compared to blueberry, it has nine times the calcium, five times the iron, four times the magnesium, nearly five times the phosphorous and four times the potassium; in terms of vitamins, it has 18 times the vitamin C and four times as much vitamin A. Blackcurrant also has more than twice the anthocyanin content (second only to aronia) and twice the flavanols of blueberry. A study at the University of Glasglow (Borges et al, 2010) found that black currants had a higher antioxidant capacity and anthocyanin content than blueberries, raspberries, cranberries and red currants. Blackcurrant holds multiple virtues, but its primary action is to stimulate cortisol, a powerful anti-inflammatory and universal drainer able to cleanse the whole body. In gemmotherapy (a detoxification and draining method which uses the extracts of fresh buds and young plant shoots), the fresh buds of blackcurrant are mainly used. These buds act on all the parameters of inflammation and especially that of allergic inflammation. It is the stimulation of the adrenal gland that generates this natural cortisone, which helps to explain its anti-inflammatory and anti-allergic actions. Blackcurrants contain many vitamins including vitamin A, B-5, B-6, B-1 and E. The most significant is vitamin C. In fact, blackcurrants carry four times the amount of vitamin C as oranges, and double the amount of antioxidants as blueberries. The benefits of vitamin C are many. The body uses vitamin C to metabolise protein and form collagen, which is essential for skin care and anti-ageing. Blackcurrants have a direct effect on your body’s inflammatory response. Blackcurrant seed oil contains gamma-linolenic acid (GLA), a type of omega-6 fatty acid that’s been said to help ease inflammation in the body. The high GLA and anthocyanin content can help reduce joint or muscle: pain, stiffness, soreness and damage. In some studies, GLA supplements were so effective that participants with rheumatoid arthritis could reduce their usual pain medications. Grape-based drinks like wine and juice are known to help decrease plaque build-up, but blackcurrant juice, as well as pomegranate juice, is far more potent. Blackcurrant is high in potassium and GLA, which can help lower your blood pressure too. The GLA also helps cells in your heart resist damage and slows down platelet clumping in your blood vessels. In addition, one study found that blackcurrant powder increased heart blood flow and decreased overall peripheral resistance. This suggests that blackcurrant may help you recover after exercise. Research shows that GLA and linoleic acid, which are found in vitamin C, may be promising for treating dry eye. Thankfully, blackcurrants are packed with both of those. Clinical trials with blackcurrants found that these berries improve eye function, including the eyes’ ability to adapt to the dark, blood flow to the eyes, slowed progression of visual field deterioration in people with glaucoma and symptoms of visual fatigue.